This online slot is another recent release by Realistic Games. It is a simple yet an amazing slot game that provides some very decent wins. 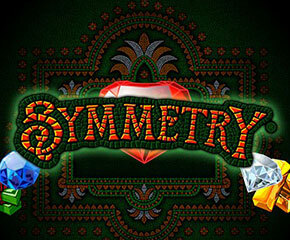 Symmetry in the world is the sign of beauty as well as harmony and is going to be loved by the slot fans for its never ending rewarding actions. The minimum bet is of £0.01 per spin and the maximum bet of £100.00 per spin can be placed on by the players. The slot comes with 5 reels, 3 rows and 10 fixed paylines. The reels are set against the attractive background having mosaic tiles formed of brown and green colour. 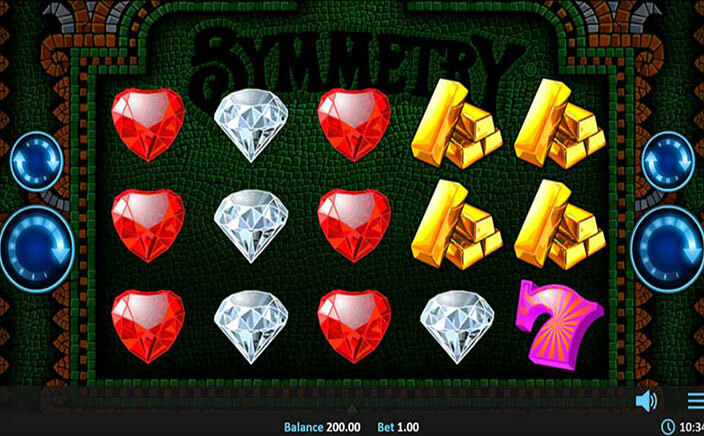 Symmetry slots include decently crafted symbols such as the Jackpot symbol, stacks of cash, pink coloured seven, golden bars and 4 jewels of different colours- blue sapphires, white diamonds, red rubies and purple amethysts. However, it has no wild and bonus symbols. The winning combos should be formed upon the paylines but need not begin from the left side. The high-quality animations and an autoplay feature to play with makes this slot game a fun task to indulge in. When players get three or more same symbols upon the adjacent reels, then they will create a winning combo for up to ten paylines. When all of the five reels contain stacked symbols, then the players will continue ahead to the bonus round. Under this, a reel will be randomly selected for the players and they will receive the re-spin where that selected reel will be held in place. And, then all the other reels will get filled with one, two or three of the similar symbols. When the reels one and five and two and four match during a base game, then the players will activate the Symmetry Bonus. Here, the players get random reels selected. Then, they are provided with the full five reels immediately with the similar symbol, thus creating the full house of the symbol wins. This is one of the best slot games from Realistic Games. It offers unique bonus features. Due to its good gameplay, this slot game is performing really well for the slot fans. The return to player percentage of this slot is 95.56%.